SpyAgent can be used in many computer environments, and in countless ways. Here are a few possible uses for SpyAgent. SpyAgent can record any activity performed by a user on your computer. Click here to read more. Log each and every keystroke a user types while using Windows. Including passwords and emails. Click here to read more. Control what websites users can visit, and what programs they can run while using your computer. Click here to read more. System Requirements SpyAgent FAQ SpyAgent's Awards Stealth Edition Stealth Install Guide Monitoring Software Compare Software Why Spytech? 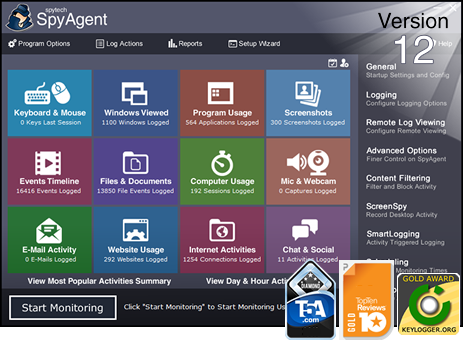 TopTenReviews Rates SpyAgent as 2010-2017's #1 Computer Monitoring Software! "Spytech SpyAgent was propelled to the top of our rankings because of its numerous and enriched features. The number two and three ranked products lack the comprehensive functionality of Spytech SpyAgent. SpyAgent runs as a background process and does not drain system resources. The User Interface (UI) provides a highly organized and easy to navigate portal for the management of the application's numerous features. The application is a reliable and surprisingly affordable tool for both home and business users." Wanted you to know that I tried 6 different software packages for my home PC and yours is absolutely the best. I have already recommended it to 3 other people who were looking for such a product. The interface is amazingly easy and intuitive, the data which is captured far exceeded my expectations and is extremely easy to retrieve." I found NetVizor's superior functionality and ease of implementation to be just what we needed. Incorporating the use of NetVizor into our policies and procedures reduced non-work related web surfing to zero. NetVisor freed up much needed bandwidth for other applications and immediately increased our employee productivity. The return on investment was immediate and continues to benefit our bottom line every day." and I must say it has been very handy in monitoring my children's daily activities on the internet and while viewing who they are chatting with so they don't become involved with someone that shouldn't be talking to while chatting online. I really would like to help out your company and other parents that feel the same way I do about protecting their children. Thank you!" SpyAgent Ranked #1 at Keylogger.Org - Leading Reviewers of Monitoring Software! "Wow. This program is awesome. Now having seen it run. I can't believe the details on every item. The simplicity of setting up logging is very user friendly. Well worth the price!" "I have SpyAgent on three computers at home. It is a great product. It has been very helpful for my family. I am a family therapist and share about your product each month with many parents who are looking for options to keep their homes cyber-safe." "Thank you so much for your help and patience. You always go above and beyond service. I tell people about your software products and how much of a help you provide. Again, thank you so much for helping me." "I have been using your product now for about a year. I have bought a couple of packages from you and they prove continuously to be imperative to my organisation. Furthermore your technical staff are second to none!!! They ALWAYS respond so quickly and they are always on the ball"